A beautiful assortment of purebred bantams chicken eggs made up from all of the different varieties that we hatch. We cannot guarantee to either omit or add certain breeds, but this assortment will include a nice variety of at least 5 different kinds of purebred bantam chicken eggs. how long can you keep an egg before you start to incubate it? 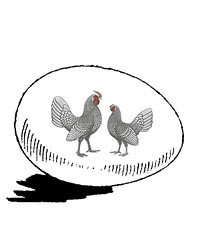 Eggs can be stored for no more than 10 days before putting them in the incubator. If you order our hatching eggs, you should start incubating within a couple days. Big disappointmentI have ordered from this farm two times, each time a dozen of eggs and NONE of them hatched! I am a teacher and I wanted to do something fun with my students. We followed the instructions (both times) the same as indicated on the instruction that came with the package. We weee soooo excited and the students were so looking forward to seeing the chicks...and both times, none of them were hatched. With the first batch, we waited until 25 days because we didn’t want to give up, and we opened up some eggs and found out they weren’t even fertilized, it was just white and yolk inside. With the second batch, we did the samething and it was just a great disappointment! We didn’t expect all the eggs to hatch but not even one?????????? This is truly a rip off! I have ordered eggs from other companies and they weee soooooo much better...this one is beyond disappointment, will never come back and will definitely share this with others to warn them!!!!!! !